Learn about medium and heavy-duty vehicles that operate on conventional or renewable natural gas, available refueling options, and maintenance facility modifications needed to ensure the safe operation of gaseous-fuel vehicles. Wind turbines are soaring to record sizes. The average rotor diameter of turbines installed in 2016 grew to 354 feet, up 127 percent since 1998–1999 and 13% over the previous 5-year average. TOP 10 THINGS YOU DIDN'T KNOW ABOUT WIND POWER. Greater Rochester Clean Cities is a U.S. Department of Energy sponsored program designed to encourage the use of alternative fuel vehicles (AFVs) and their underlying support systems throughout the Greater Rochester area. Our organization is built on the premise that we can change our communities for the better through cooperation and voluntary partnerships, working to reduce our reliance on imported oil and improve air quality. Through GRCC, we develop public/private partnerships to promote alternative fuels and vehicles, fuel blends, fuel economy, hybrid vehicles, and idle reduction. Alternative fuels are options to gasoline or diesel including propane, natural gas, electricity, hydrogen, methanol, biodiesel, and ethanol. Each year we increase our dependence on imported oil — which increases the trade deficit, costs us jobs, and undermines our national security. Moreover, emissions from vehicles are the single largest contributor to air pollution in the Rochester region. The U.S. consumes nearly 20 million barrels of oil per day, of which almost 60% is imported. Our nation spends about $260 billion on petroleum imports per year—money that leaves our economy, taking jobs with it. Moreover, imports are expected to grow to nearly 70% by the end of the decade. These forces have encouraged the development of new domestic sources of power for vehicles. Greater Rochester Clean Cities Coordinator David Keefe was recognized at the Department of Energy’s 2018 National Clean Cities Cities Coordinator Training Workshop. 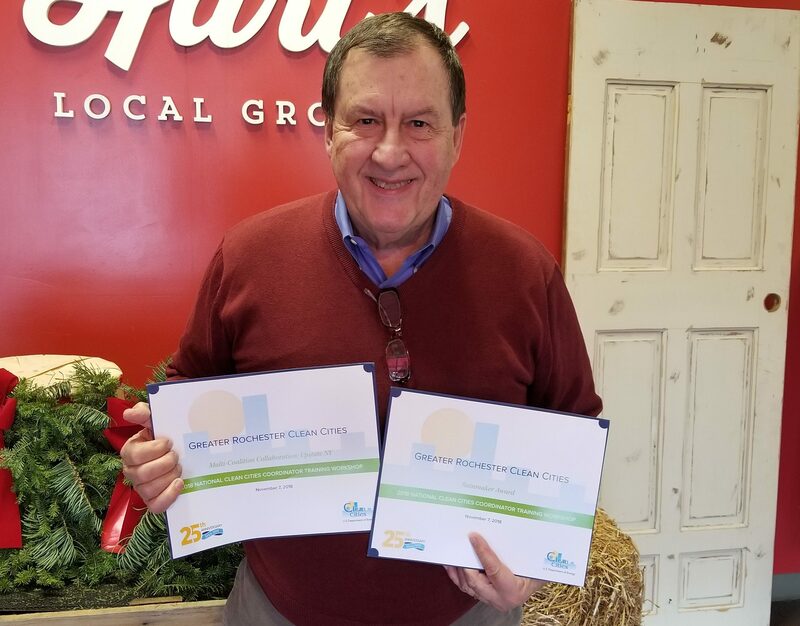 David was awarded the “Multi-Coalition Collaboration: Upstate NY” award, as well as the “Rainmaker Award” for his role in securing funding for local clean fuel initiatives. Greater Rochester Clean Cities has gained over $1.75 million in CMAQ funding. Contact us to find out how we can assist your alternative fuels project.